isn’t she magnificent? It just so happens that Anado and Richard found her for a song, and now she’s one of their most highly prized possessions! 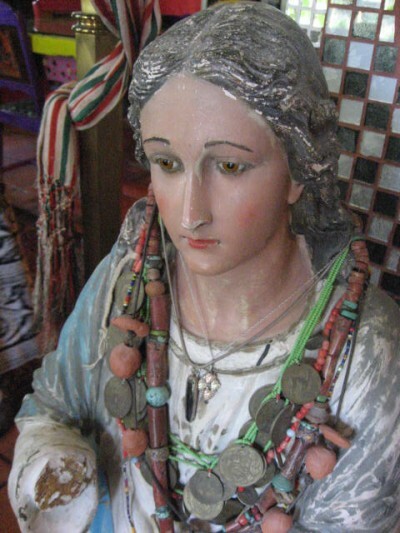 What some of us would give to have such a sweet vintage Mary watching over our homes, no? Still more to come from Casa Color…really! Check out more Virgins today @ http://corazon.typepad.com/. ~ by Dawn Elliott on December 4, 2012. You are so right – what would I give to have this beauty in my home!! one can only but dream! She’s really lovely with all of her necklaces. These neck adornments are amazing! Yes, one could only wish for this beautiful Mary at the homesite. Stunning. Thank you. Anado and Richard are very lucky. I would wish to have such a treasure. I remember her — so sweet and unassuming. What I really love about her is her bare head. 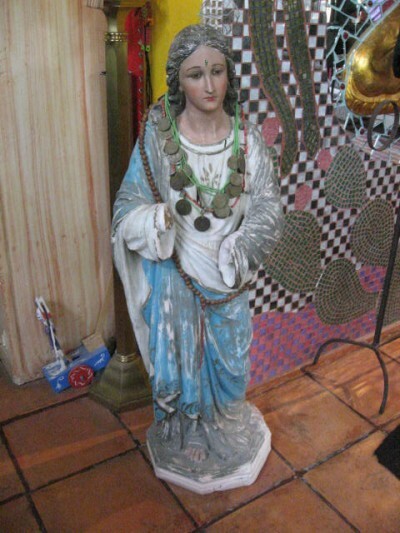 unusual image of Mary with no head covering! such serenity in her face; I long to have that feeling. Beautiful Mary. I have never seen one with an uncover head though. and i would love to reside at anywhere called casa color! i think i shall have to name my wee house, our studio has a name why not the house, as the English do! She is lovely! There is always such sad sweetness in Mary’s eyes. She is absolutely exquisite! I’m late to Mornings With Mary but I’m board now. She is showing her beauty today. I bow in wonder before her!